Consider the following scenario: You have a large spreadsheet with many hundreds of rows. Each row has a couple of data columns and then a column or two that perform calculations on those data columns. Once the data columns are set, the information in the calculated columns never changes. However, Excel must still perform the calculations every time it goes through a recalculation cycle. These recalculations obviously slow down Excel. You can see if your worksheet is speedier if you simply copy the cells in the columns being calculated and then use Paste Special to paste them as Values. The formulas are replaced with the calculated values, and Excel no longer has to recalculate hundreds of cells which now contain static values. 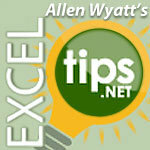 This post appears with permission from Allen Wyatt and Excel.Tips.Net. Why Do Images in My Word Document Move?